Now, I'm not writing this post to be a Debbie Downer but rather just so that we keep our health and food consumption in mind over the Holidays. There are many contradictory studies that state the average weight gain during the Holiday's range from 1-7 lbs. Regardless, weight gain can and often does happen. As a Wellness Consultant I am constantly working with clients to avoid weight gain from occurring during the Holiday season and here are some popular tips I cover. 1. When at a Holiday gathering take a look at all the appetizers provided. Choose which one's look the best and you feel would be worth the calories. When people mindlessly keep grabbing from the appetizers they can eat as many as 800 calories even before dinner, dessert and drinks! If plates are provided place the chosen appetizers on the plate and don't go back for seconds. We have a tendency at parties to eat mindlessly while chatting so, by putting a certain amount of food on a plate we can help combat the never-ending chip and dip habit. 2. Cocktails come along with Holiday parties and I'd by lying if I said I didn't indulge. Go ahead and drink up but be conscious of the cocktails you choose. A lot of drinks that contain fruit juices or pre-made mixes are high in sugars and calories. If possible make yourself a vodka soda with a splash of cranberry juice for extra flavor or a Mojito if it's made naturally without the pre-made mix. Keep away from drinks such as eggnog, White Russians and Margaritas. 3. When eating your main course only place the amount that you intend to eat on your plate. We have a tendency to fill our plates which tricks the minds to think that we must finish it all. Instead place a moderate amount on your plate and you will be satisfied without that uncomfortably full feeling. 4. Now on to desserts, my favorite part. Again like the appetizers, scope out what kind of treats they are offering and decide for yourself which to splurge on. Instead of grabbing a little bit of everything, only choose the one thing that you feel you can't leave without and stick with that. This in turn may save you up to 500 calories!! 5. Exercise is crucial and something that often takes the back seat when life gets hectic. People are the most successful when they workout early in the morning before work because they are able to get the workout done leaving no excuses for the evening time. Treat your workouts as a work meeting or a doctors appointment that you must attend. You wouldn't just skip a doctors appointment or work meeting would you? 6. Drink water!! We drink coffee, we drink diet sodas and tea throughout the day but forget to drink our water. Caffeinated drinks act as diuretics which actually dehydrate the body leading to fatigue, loss of concentration, and headaches. For every caffeniated drink you have it is suggested to have an extra glass of water to make up for this. You should have approx. 64 oz of water/day however, for those who workout intensely or have a bigger build it is suggested to drink up to 80 oz. 7. Watch your stress. Stress levels seem to rise as the Holidays approach, from getting your shopping done to work deadlines we seem to be a bit more tense. When you feel your stress levels increase, take a 5-10 minute break and practice deep (diaphragmatic) breathing, or do something you know to be effective for you individually (listen to music, draw, write, call a friend, read, go for a walk). 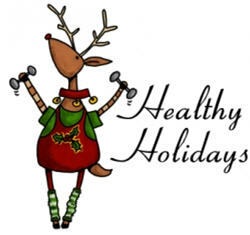 Hope these tips help to ensure you have a fun and healthy Holiday season! ...speaking of cocktails, I found out that Sake has 40% less calories then Vodka. That being said if you want to get hammered you are going to have to be drinking more, which balances out the difference, but if you are only having a couple drinks it's the way to go! I'll try to find some Sake cocktails for us! Blogged it! :) I'm lightning fast!